DeepCool first showed off its QuadStellar Smart Case nearly a year back, at its CES 2017 stand in January. Now, as the year draws to a close, it has launched globally at US$399. Beyond its striking segmented design, the QuadStellar provides the following headline features; support for up to E-ATX motherboards, RGB lighting, intelligent fan control and oodles of expansion options. 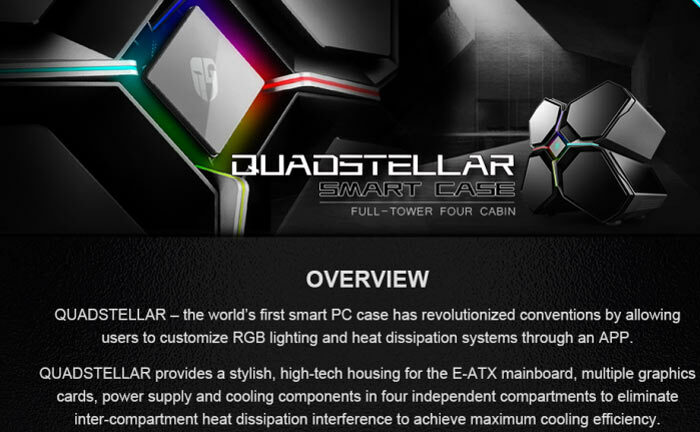 Of course the DeepCool QuadStellar Design is an evolution of the established TriStellar PC case. 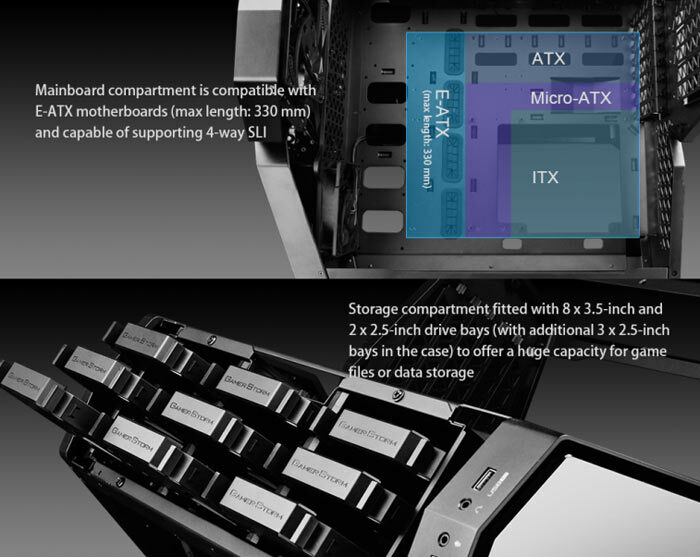 More segments allow for more of everything, and indeed the TriStellar is only a mini-ITX design, despite its large volume. Taking the segmented idea further the QuadStellar lobes each hold a different heat emitting component set; storage (8 x 3.5" and 2 x 2.5" + 3x 2.5" elsewhere in chassis), power, video cards (up to 3x 380mm) are all compartmented and the central motherboard area has quite a large space too. As a 'Smart Case' the QuadStellar's RGB lighting, as well as fans/thermals, can be controlled by the QuadStellar App on your smart device. DeepCool made the frame of this case from cast aluminium while exterior surfaces are a mix of aluminium and magnetic mounted tempered glass panels. Additionally front mounted dust filters are magnetically mounted for easy cleaning. Looking round the back there are triangular vents to facilitate air flow exit. Users have easy access to power/reset, two USB 3.0 ports, microphone and headphone jacks on the top-left front segment edge panel. Please check out the full tech specs below for the full QuadStellar specs and max compatibility information. On the topic of availability, despite Guru3D saying the new case has launched today, and AndandTech saying it will launch globally at the end of December, DeepCool responded to a Facebook post three weeks ago stating availability would be from February 2018. Can get the same functionality a lot cheaper. It's design in my opinion isn't even that conducive towards showing off a build. Going to appeal to someone who loves the design, and well that isn't me. The design is actually nice - if you want to make spaceship like gaming room it will fit well. Also, it allows you too put high end stuff inside. Not for me, but i enjoy the idea. Put an optical drive slot in the front and it'll look like a space station from Elite.